The saga continues 200 years after Ripley sacrificed herself for the sake of humanity. Her erstwhile employers long gone, this time it is the military that resurrects the one-woman killing machine through genetic cloning to extract the alien from within her, but during the process her DNA is fused with the queen and then the aliens escape. Now Ripley must decide where her allegiance lies. 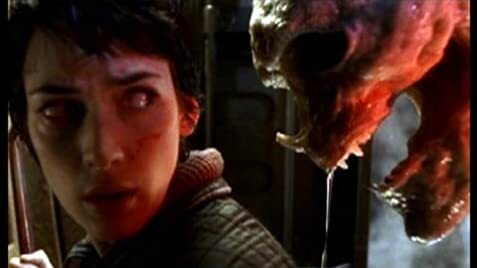 Ripley: [voiceover] My mommy always said there were no monsters. No real ones. But there are. The main titles (the distorted shots of the 7 early Ripley clones in the theatrical cut) have been replaced by an alternate opening, which starts with a close-up of a growling alien mouth. As the camera pulls back, it is revealed to be the beak of a fly, that is subsequently squashed by a thumb of a soldier. The soldier uses a straw to blow the fly's blood against a window, which shows that he is actually sitting in a nacell of the Auriga spaceship. The rest of the shot shows the Auriga slowly flying away from camera. Directly after the chestburster has been surgically removed from Ripley 8, she wakes up from her narcosis, grips the surgeon's arm and breaks it. In the scene where Ripley is shown drawings of a glove and fruit, directly after Genral Perez, Wren and Gediman leave, the doctor shows Ripley a drawing of a young, blond girl, which seems to trigger an emotional memory in her. The 'Betty introduction scene has been completely re-edited and extended. The scene now starts with the Betty flying towards the Auriga, Elgyn giving the clearance code over the radio (E-A-T-M-E), but now he flirts some more with Hillard, and warns Call and Vriess over the intercom to get ready. Next, Call and Vriess are shown working on the cargo, followed by some extended dialogue in which Vriess tells Call an obscene joke. This is followed by the scene in which Christie gets his hidden weapons (which came first in the original cut). Next is Johner's 'target practice', Vriess then throws a tool to his head, Call calls him names, but Johner simply replies by asking for his knife. When Vriess comments on his alcoholism, Johner demands his knife back, Call breaks it, Johner threatens her, and there is an extra line from Vriess that he and Call deserve better company. During the deal between Elgyn and Perez, Elgyn has some more 'flattering' remarks about Call, thinking Vriess has an eye on her. After Elgyn asks Perez for three days bed and board, Perez agrees under a few conditions (no trespassing in restricted areas, no trouble, no fighting). After Purvis shouts "What's in-f###ing-side me?!? ", Wren answers: "A parasite! A foreign element!" After Call says that Purvis can be frozen and operated later, she has another run-in with Johner, followed by Christie agreeing that Purvis comes, but saying he will shoot him if he starts acting funny. Just before everyone takes a dive through the flooded kitchen, Christie and DiStephano have a short conversation on Christie's weapons ('the disposable kind'), and Call reminds everyone to take a deep breath. In the chapel, just after Purvis' fake chestburst, there is an extended line from Call, stating she recalibrated ground level, sending the ship into an uninhabited quadrant of Earth, before she mentions time of impact. After Ripley asks if she's the new a##hole model, she replies she couldn't let humanity annihilate itself. Ripley comments that she once tried to save people as well; she remembers a girl that had bad dreams, but she died despite her help, and now she can't even remember her name. After DiStephano enters to take them with him, Ripley asks Call if she dreams, which Call does thanks to neural processors; Ripley says she dreams about the aliens every night, and that she used to be afraid, but not anymore, since it is always worse when she wakes up. After Johner kissed Vriess for getting them safely through Earth's atmosphere, there is an alternate ending with the Betty landing on Earth. Call warns Ripley for the military that will come looking for her soon. She says someone can get pretty lost on Earth, and asks Ripley what to do. Ripley replies that she doesn't know, since she is a stranger there herself. The camera then goes up, to reveal a post-apocalyptical Paris. Q: Why is Call so determined to save humanity? Q: How can the Alien inside Ripley be cloned, even though they only had Ripley's DNA? I am one of those older (mature) reviewers who can claim to have seen this series in real time, in theatres. First I will share my recollection of what that was like at the time. Alien 1 was magnificent. If you were to make a list of the greatest films of all time (and all reviewers do this, if only subconsciously) Alien 1 would be make the list. Alien 2 was doubly astonishing because it was almost as good as Alien 1 and, as any film buff knows, the sequel is rarely if ever that good. 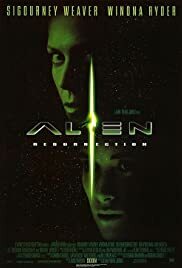 Expectations were high going into Alien 3, the prison planet movie, but the entry was disappointing and for the first time fans started to wonder if the franchise was going to self-destruct. For this reason, Alien 4, Resurrection, was disappointing in every possible way. It was a weak concept, poorly timed and poorly executed. The template for the story was more "haunted house" than sci-fi. Not only was the story flawed but at the end of the day it ran out of steam after the first 30 minutes and became tedious for the audience, a sin no film should ever commit. All the characters were so unlikable -- including to a large extent Weaver's saucy clone -- that even if the audience WANTED to root for a character, there was no one worthy of the effort. I got hold of the director's cut and re-reviewed this film because another member posted a review saying this film was unappreciated. OK, so let's appreciate it for what it is -- a flawed entry that almost destroyed the franchise. The IMDb rating is solid -- in other words, this is really a very weak film.